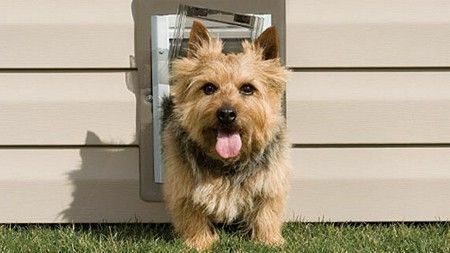 Simplify your life with an all-weather pet door designed for maximum energy efficiency and durability in the harshest weather. Give your furry friend access to shelter day and night whether they face blazing heat, pounding rain, or freezing cold. Keep them safe and happy without any fuss or scratching at the door. You'll no longer have to play doorman for your pet every time he needs to go out. The up, down, back and forth routine of letting your pet in and out all day interrupts more of your time than you probably realize. Pets that are home alone all day while you're at work, have to "hold it" for a long time, which can be very uncomfortable at the very least. Puppies and older dogs, in particular, have a much harder time controlling their bladders for extended periods. Free access to the outdoors may eliminate the mess and odors of accidents in your home. Most pets don't get nearly the amount of exercise they need. Access to the outdoors where they can run and play helps keep pets active, trim, and healthy. Scratch marks from a pet wanting to go out or come in can ruin the appearance of your doors. The sights, sounds, and smells of the outdoors provide excellent mental stimulation to keep pets acting younger and more alert. Bored or stressed pets often display behavior problems like chewing on furniture, tearing up pillows, or getting into food or other forbidden places. We suggest that you purchase the pet door of your choice that works best for your situation, breed, and expectations. 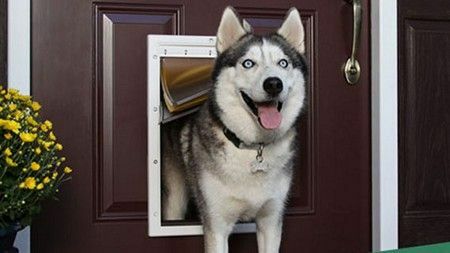 Rockland County Handyman is committed to providing quality dog door installation. We proudly guarantee our workmanship and fully abide by the standards of the industry. — Unleash a New World of Freedom for Your Pet!